B. Thomas (Arlington, Texas, United States) on 13 April 2012 in Landscape & Rural. The Shiprock, rising 1,583 above the high-desert plain on the Navajo Nation in San Juan County, New Mexico is the remnant of an explosive volcanic eruption that occurred around 30 million years ago. It is a sacred site for the Navajo, whose mythology says the rock was once a giant bird that brought their ancestors to the area. The Navajo call it Tse Bitai, or "rock with wings." 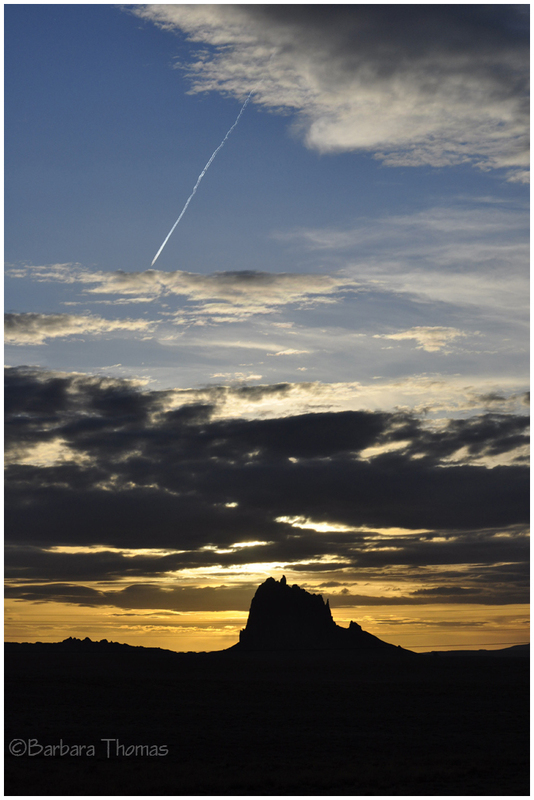 Shiprock is one of the most prominent landmarks in northwestern New Mexico. Some say it looks like a ship on a desert sea when viewed from a distance. Very nice - love the strong silhouette created by the rock. Well done, Barbara! Gorgeous, mysterious capture and frame, Barbara. A fine shot of this remarkable landmark rock. You also got a beautiful sky for a background. Well done. I've actually seen this rock from a distance and my first impression was that it was floating out in the desert, it was rather eerie. I later learned about its folk lore. Love your shot with perfect time of day lighting. Great sky. Beautiful capture! Love how the mountains are silhouetted against a gorgeous sky. Nice silhouette! I love the colors, what a contrast to the bleached out daytime desert! Nice sunset and hill silhouette. Thanks for your geographic and historic explanations.